This broad survey introduces readers to the major themes, figures, traditions and theories in Western historical thought, tracing its evolution from biblical times to the present. 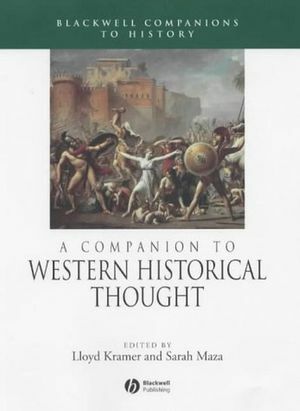 Surveys the evolution of historical thought in the Western World from biblical times to the present day. Provides students with the background to contemporary historical debates and approaches. Serves as a useful reference for researchers and teachers. Includes chapters by 24 leading historians. Lloyd Kramer is Professor of History at the University of North Carolina, Chapel Hill. His previous publications include Threshold of a New World: Intellectuals and the Exile Experience in Paris, 1830-1848 (1988), Lafayette in Two Worlds: Public Cultures and Personal Identities in an Age of Revolutions (1996), and Nationalism: Political Cultures in Europe and America, 1775-1865 (1998). Sarah Maza is Jane Long Professor of Arts and Sciences at Northwestern University in Evanston, Illinois. She is the author of Servants and Masters in Eighteenth-century France (1983) and Private Lives and Public Affairs: The Causes Célèbres of Pre-Revolutionary France (1993).